Failure helps you understand what you want and more importantly who you want to be as a leader. Success is often preceded by major failure. That's according to Jean Case, CEO of the Case Foundation and chairman of the National Geographic Society. Failure can teach you valuable lessons that shape your future work; failure can also let you know if you're following the wrong career path. Failure can seem like an ugly word and is often cast as the opposite of success. But the experience of failure can be transformative in ways that success is not. If you examine the life of anyone who has achieved something extraordinary, chances are you'll find a story of failure somewhere along the way. While not all failures have a happy ending, most happy endings have a failure story. So, rather than viewing failure as an embarrassment, or shameful, or something to be endured, acknowledging failure and making it matter can actually make your life better. I've always been intrigued by the question, "In the face of failure, would you try again?" Underlying this question is the idea that failure is not an end point, but part of a process. If we let our failures teach us, we can actually view them as beneficial. When I speak on college campuses, I go out of my way to talk about my own "failure rsum," recounting what didn't go so right on my career journey, and what lessons I was able to apply down the line that made me more effective in my work. One of my favorite stories about learning from failure involves IBM's founder, Thomas Watson, who once said, "If you want to succeed, double your failure rate." After the Great Depression, when Watson was trying to restore his business, he built up inventories to secure a million dollar government contract. But his salesman failed to get the contract, and he went to Watson's office to hand in his resignation. Watson handed back the resignation letter and said, "Why would I accept this when I have just invested one million dollars in your education?" The late Steve Jobs once spoke about the aftermath of his greatest failure -- getting fired from Apple, the company he'd founded. "I didn't see it then," he admitted, "but it turned out that getting fired from Apple was the best thing that could have ever happened to me. The heaviness of being successful was replaced by the lightness of being a beginner again, less sure about everything. It freed me to enter one of the most creative periods of my life." This insight, shared after Jobs returned to lead Apple, upends typical ideas about success and failure. What if failure was the key to success? Astro Teller, who heads X, Google's invention laboratory, has actually built failure into the process of discovery there. His teams spend much of their time finding out what doesn't work. He explains, "Teams kill their ideas as soon as the evidence is on the table because they're rewarded for it. They get applause from their peers." Teller is describing a process that produces creativity because the teams are always in search of a better way. He's proud of his designation as "the father of modern failure." Sometimes we fail because we're following the wrong path, and that might have been the case for a young Oprah Winfrey, who suffered the greatest humiliation of her career when she was fired from her anchor position on the local news in Baltimore. It was a very public failure and hard to recover from. She still remembers feeling humiliated and devastated. But then the station moved her to a struggling talk show called People Are Talking, and Oprah learned that she had a gift she hadn't known about. In the talk format, her personality and warmth shone through. Today Oprah is one of the most powerful business executives in the world, and she says she got that way by being true to herself. "Failure is just life trying to move us in another direction," she has said. Michael Jordan has said, "I've lost almost 300 games. Twenty-six times I've been trusted to take the game-winning shot and missed. I've failed over and over and over again in my life. And that is why I succeed." Although a typical view holds that failure leads to despair and low self-esteem, Jordan and others see it as an opportunity to test their skills and resolve. It's a great lesson for all of us, and I think it is an especially meaningful one to teach our children. We want them to learn resilience -- how to fall and get up again, knowing that's how they'll thrive. JK Rowling, the wildly successful author of the Harry Potter series, was poor and struggling when she wrote her first book. She could have papered her walls with the rejection letters she received from editors. But she kept going until she received the one letter that was finally a yes. How did she stay motivated? "I had nothing to lose," she said, "and sometimes that makes you brave enough to try." Like most Washington, DC, residents, I was elated when the Washington Capitals won the World Cup in 2018, the first time in history the cup came to our city. Ted Leonsis, who had owned the team since 1999, had never let repeated failures cause him to lose focus. He just concentrated on continuing to build an elite team. He understood that he was in it for the long haul. And when his team finally won, he celebrated, saying, "It is much, much sweeter to go through all the pain and suffering to get to the top of the mountain. That's the way life is. That's the way great businesses get built. It is never easy." Like many people, I too detest failure. But the truth is that anyone who has made a big bet has been willing to accept the risk of failure, and be undaunted when it comes. So why not ask yourself if failure, or the fear of failure, is getting in your way. And if you experience failure on your own fearless journey, remember you are failing in the footsteps of giants - many who have come before you and have done extraordinary things. Pick up and let the lessons of the failure propel you forward. 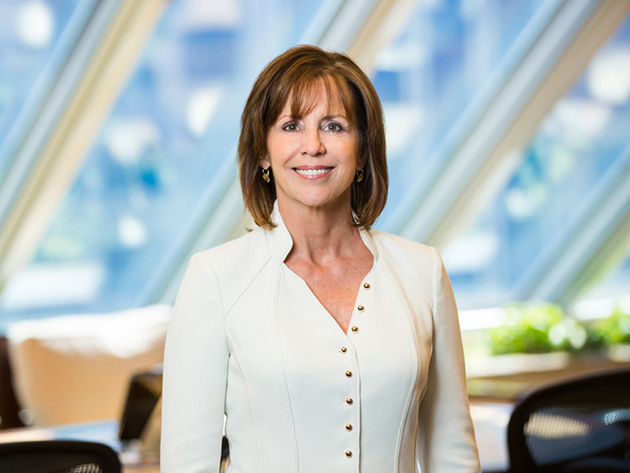 Jean Case, the Chairman of the National Geographic Society and CEO of the Case Foundation, is a philanthropist, investor and internet and impact investing pioneer who advocates for the importance of embracing a more fearless approach to innovate and bring about transformational breakthroughs. She is the author of the new book Be Fearless: 5 Principles For A Life Of Breakthroughs And Purpose.